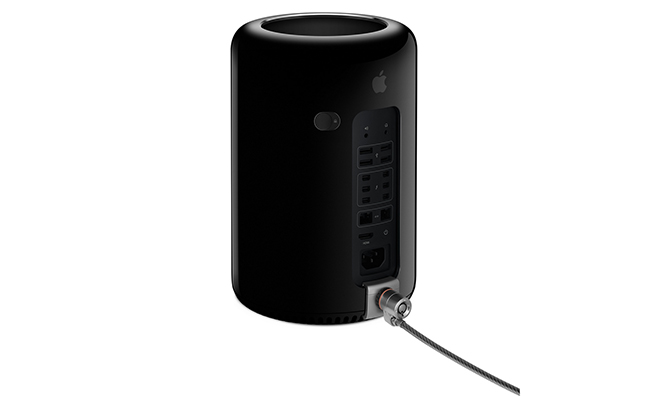 Apple on Tuesday introduced the first official hardware security adapter specifically designed for the late-2013 Mac Pro, offering owners basic protection against theft and tampering. According to Apple's description of the $50 Mac Pro Security Lock Adapter, the accessory clamps on to the machine without need for special tools and is compatible with most third-party Kensington locks or similar products. A lock is not included in the package. The adapter latches on to the Mac Pro's pedestal and aluminum case, granting access to all ports and the power cord while preventing the case from being opened. In essence, the adapter serves as a specialized anchor point to which users can attach a third-party lock of their choosing. Since Apple opted to not build a security mechanism or lock attachment point into the Mac Pro's sleek chassis, third-party accessory makers jumped in with their own designs, including a few that required case modifications. Apple notes its in-house design is completely temporary and can be installed and removed without damaging the Mac Pro's highly polished aluminum case. Apple's $50 Mac Pro Security Lock Adapter is available from the Online Apple Store and will be showing up at brick-and-mortar outlets soon.